Sonnyboy on the Lower East Side is the kind of neighborhood spot you can get used to. 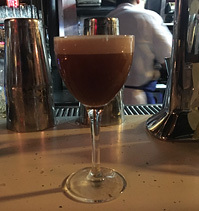 The space with an open kitchen, counter and tables has a friendly, diner-ish vibe with inventive cocktails like a tasty Espresso Martini. The restaurant, run by three young Australian partners, and an Aussie chef, are serving breakfast, lunch, brunch and dinner with oversized burgers, salads, a roast of-the-day, and seafood. Breakfast brings hotcakes with mascarpone & berries, harissa folded eggs with brussel sprouts, and smashed avocado with feta, zaatar & pistachios. Assorted salads are also offered along with a crispy chicken sandwich. Outdoor dining is available when the weather permits.